Geshe Thupten Jinpa, Ph.D., is a former member of Gaden Shartse Dokhang Khangston. 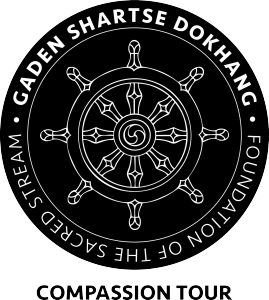 He is the primary spokesperson for the tour and several of his senior students are leading the tour, including Geshe Lharampa Thubten Tenzin. He was born in Tibet in 1958. He received his early education and training as a monk at Zongkar Chöde Monastery in South India and later joined the Shartse College of Ganden monastic university, South India, where he received the Geshe Lharam degree. He taught Buddhist epistemology, metaphysics, Middle Way philosophy and Buddhist psychology at Ganden for five years. Jinpa also holds B.A. Honors in Western Philosophy and a Ph.D. in Religious Studies, both from Cambridge University, UK. Since 1985 he has been a principal English translator to H.H. the Dalai Lama and has traveled extensively in this capacity. He has translated and edited more than 10 books by the Dalai Lama including Healing Anger, Dzogchen, Path to Bliss, The World of Tibetan Buddhism, The Good Heart: The Dalai Lama Explores the Heart of Christianity, and the New York Times bestseller Ethics for the New Millennium. His own works include numerous contributions to various collections and academic journals and several works in Tibetan language. His latest works are Tibetan Songs of Spiritual Experience (co-edited with Jas Elsner), and Self, Reality and Reason in Tibetan Thought: Tsongkhapa’s Quest for the Middle View. From 1996 to 1999, he was the Margaret Smith Research Fellow in Eastern Religion at Girton College, Cambridge University, UK. At present he is the president of the Institute of Tibetan Classics in Montréal, Canada, and the editor-in-chief of the translation project The Library of Tibetan Classics, being developed by the Institute. 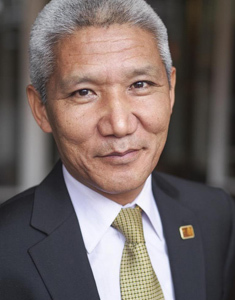 He is on the advisory board of various educational and cultural organizations such as the Mind and Life Institute (USA), The Orient Foundation (UK & India), The Meridien Trust (UK), Global Ethics and Religion (USA), and Manjushri Buddhist Online Community. He is also a Visiting Research Scholar at the Stanford Institute for Neuro-Innovation and Translational Neurosciences at Stanford University. He lives in Montréal with his wife and two young daughters.